Most importantly, our programs encourage a child’s feeling of self-worth. We strongly feel that a self-confident child with a positive attitude will grow to be a happy, successful adult. What more can we ask of education? Our facilities and equipment offer unending opportunities for play and exploration, both indoors and out. Our program recognizes that each child has individual needs and has a right to grow and develop at their own rate. We strive to meet these needs. It is our belief that the parents are the primary caregivers, responsible for their child. Our goal is co-operation and consistency of care between home and center. This is especially important in our infant and toddler scheduling. Our preschool program is based on the philosophy that children grow and develop to their fullest potential if given the opportunity to explore, create, and problem solve with materials appropriate to their developmental age. 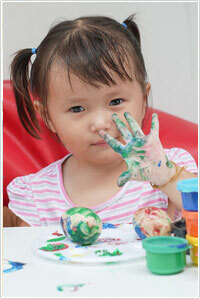 Preschool class is held daily during the morning hours for children ages 2 ½ through 5 years old. Our preschool program provides your children with many experiences: Puzzles, books, blocks, climbers, riding toys, and housekeeping play props. Children are involved in a wide variety of art experiences, encouraging the child to be creative with many types of media. A good sense of language is fostered through poetry, stories, finger plays, and songs. Group activities are spontaneous, providing attractive, stimulating, and developmentally appropriate activities. Learning about numbers, colors and letters are also a part of our daily lessons. Providing opportunities for adult/child and child/child interactions fosters social and emotional development. Yet, all the time the child is being continuously challenged. In order to begin to read and perform other academic tasks, the child must first gather meaning from the world; the child must have many satisfying sensory and sensory motor experiences, which they must touch, taste, smell, hear and see. Perceptual development follows. This is how the child interprets his/her sensory experiences, a prerequisite for developing the mind. 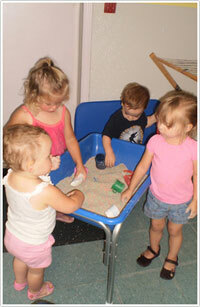 Our toddler classrooms allow a transition time period from the infant room to the more structured preschool programs. Toddlers are given the space needed to express their growing awareness of their independence. They spend most of their day in small groups allowing an opportunity to form relationships with other children and adults while away from home. With the gentle help and guidance of our professional care providers, toddlers will begin to learn to deal effectively with their emotions, play cooperatively in a group setting, assist with their own personal needs, handwashing, feeding themselves and possibly toilet training. Learning through play takes place throughout the day. Storytime, music, dance, art, dramatic play (dress up and role-playing), building blocks and climbing structures all encourage language development, simple math skills, problem-solving, physical and emotional development. We attach utmost importance to maintaining consistency of care between home and center with regards to infant scheduling. A daily record is kept while your baby is with us. We will record your infant’s feeding schedule, diaper changes and nap time. 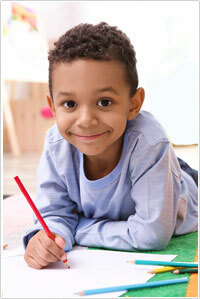 Developmental milestones are documented and shared with you at pick up time. We ask the parent who brings in the baby to fill out a form available at the center or online with comparable information. This will aid us in understanding your infant’s needs and better care for your baby. Your baby has an assigned primary care provider, but our infant room staff work together to make sure your infant’s needs are consistently met. 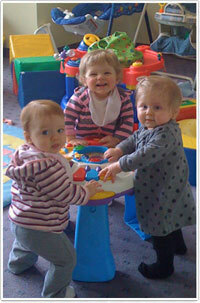 Except for naps, infants are together and have planned and spontaneous activity time in the play area in the room. With a low infant to caregiver ratio, we are able to provide plenty of quality time with your child. We go outside for stroller walks daily. Parents are welcome to call the center anytime to obtain information on their baby and/or stop by for a visit.